When creating this card, I also kept in mind a few challenges that were going on. The design for this card is from the sketch challenge that is going on over at Die Cuttin Divas this week. There is still a little time if you want to join in. I used pretty pattern papers from Paper Studio called Blanc Boutique. I also used some shimmery gray paper I had in my stash. The label is from the Artiste cartridge and cut at 2 1/2 which is embossed with the divine swirls folder. The oval is cut at 1 3/4 also from the same cartridge and inked around the edges with a Color Box~Silver ink pad. 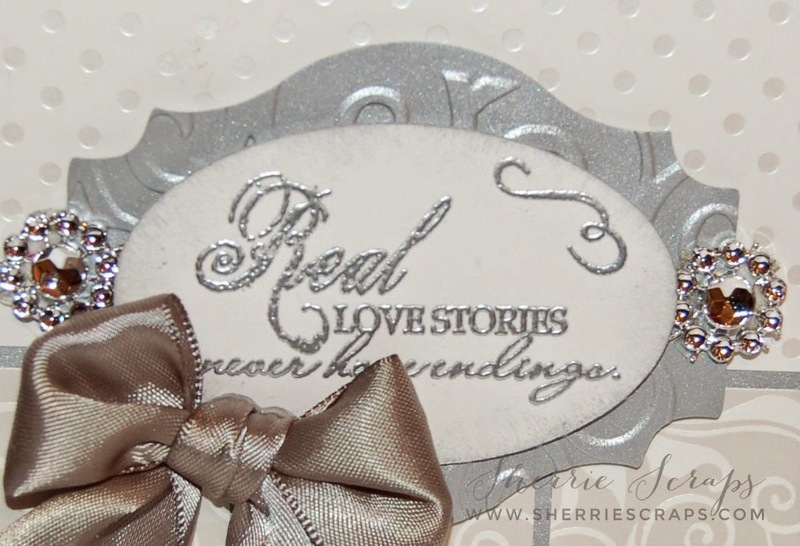 The sentiment is stamped using My Craft Spot's Happily Ever After stamp set. I heat embossed the sentiment with Top Boss~Silver embossing powder. Isn't that pretty? Stunning!! your card will brighten someones day I love the embossing. Of course I always love your bows. This is gorgeous Sherrie! What a GREAT card based on the sketch and the colors are gorgeous!! LOVE LOVE LOVE that beautiful bow!!! This is lovely. The papers, the embossing, and the BOW! make this a gorgeous wedding card that will be treasured. Thank you for sharing it with us at Die Cuttin' Divas, and I'm happy our sketch inspired you! You nailed the sketch. Love the soft colors, fabulous papers and they beautiful bows. So gorgeous! I loveeeeeeeeeeee that bow!!!!!!! WOW!! Great take on the sketch!!! WOW!! Oh Sherrie! This is the kind of card I have to study for some time to see how you brought everything together to make it so lovely & elegant! Just beautiful! Wow, Sherrie, this is so elegant and stunning!! I love the beautiful papers!! The embossing on the label, both the swirls and the heat embossing, look amazing!! And the bow is so pretty!! This is the perfect wedding card!! It's absolutely gorgeous!! Thanks so much for playing along at CDD!! Gorgeous, elegant card. I love the soft colours and shimmering papers. This is such an elegant card! Beautifully done! My dear friend, this is such a gorgeous card for the extra special occasion! The colors and shimmer are so elegant and your card design is fantastic! The embossing is beautiful, especially the heat-embossing. :o) Gorgeous sparkling accents and perfect bow, too! This will be cherished. :o) Gorgeous work as always, Sherrie! And thank you for the bloggie love all week long... your kindness and encouragement always mean so much to me. :o) Have a twinkly night! What a gorgeous, elegant card! I love the beautiful silver papers and embossing. And, that gorgeous bling just adds the perfect pop of color. What a precious elegant card... love the bow and the sweet sentiment! Gorgeous Card, so very elegant. So sorry haven't been by in awhile my friend so I am going to be stalking a bit. Hope your having a great weekend. Wow, Sherrie! Your card is gorgeous!! What a fabulous design for a wedding card! I love the shiny papers and that bow is absolutely beautiful!! I hope the wedding went well for your nephew and his new wife!! Wow!!! this is absolutely amazing...gorgeous!!! Thanks or playing along with us at Craftin Desert Diva's. Sherrie this is STUNNING....the frame, paper and that bow---gorgeous!! Oh it's just beautiful Sherrie! I love those gems and the gorgeous bow!! Hope you had a great time at the wedding. Are you still having nice weather? We are still unusually hot, but I'm not complaining because I know it's going to be cold soon, not as cold as you :) but cold for us Cali folk :) take care my friend!! Such an awesome creation! Love your style! We are so happy to have you joining us at Loves Rubber Stamps! This is simply beautiful and elegant!!! Love the pretty papers and pretty bow!! Great take on the sketch!! Thanks for joining us at DCD this week! Gorgeous, beautiful, elegant !!! All of these words came to my mind when I saw this beautiful card !! Hope you have a wonderful day my friend !!! Sherrie ~ I'm back!! Well this card is GORGEOUS along with all your creations! I took a peek around and OMG ~ What a BEAUTIFUL couple and family you have! You made it! You got through all the wedding stuff ~ YAY!! So happy for your family! I should be back to my regular stalking too! Thanks for sharing the beautiful day and couple ~ LOVE seeing LOVE!!! Gorgeous card, it looks so elegant with the colors you used! The embossed sentiment looks fabulous, gorgeous papers and colors too! 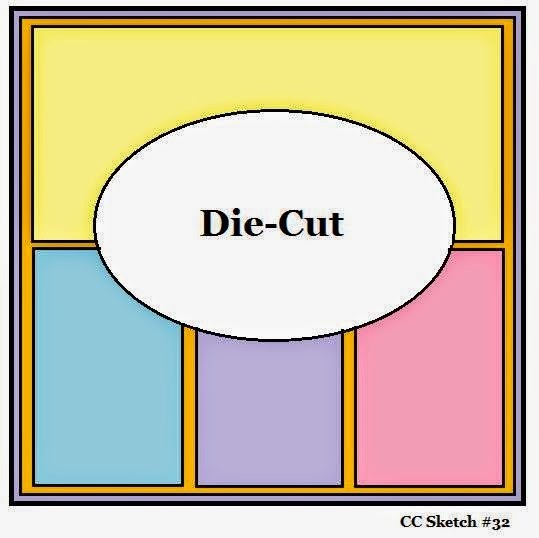 Thanks for trying my sketch at Die Cuttin' Diva. Your card is so elegant and beautiful. Beautiful and so elegant.......love the gorgeous big bow! This is just stunning! Your bow is gorgeous! A true elegant beauty! I know your nephew and his bride cherished it. Still so beautiful! Thanks for joining our Anything Goes Linky Party this week at Craftin’ Desert Divas.